Several of the stamps I used for this card are some of my very first purchased, circa 14 years ago! The stamps I used with Distress inks on the tag are brand new from Hot Off the Press. This is my first Father’s Day card for Operation Write Home this year. Our deadline is the end of April, so I need to get busy. I used Sketch #72 at Cardabilities for design inspiration. It took me forever to make this card–I just kept messing around with it! Thanks for checking things out today! 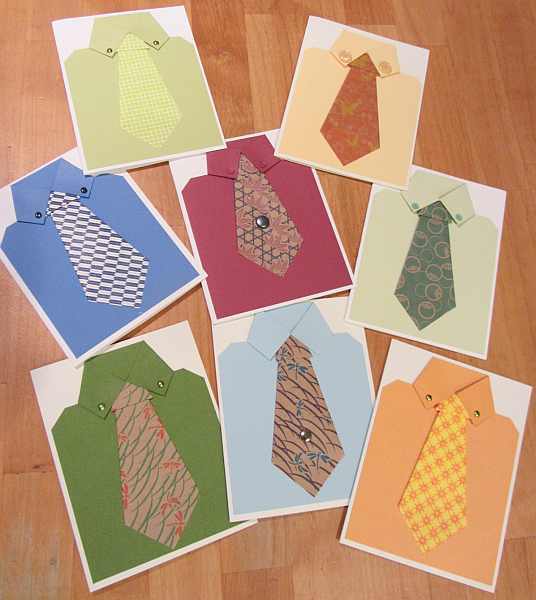 Here is a group of Origami Necktie cards that Trenton and I made again this year. 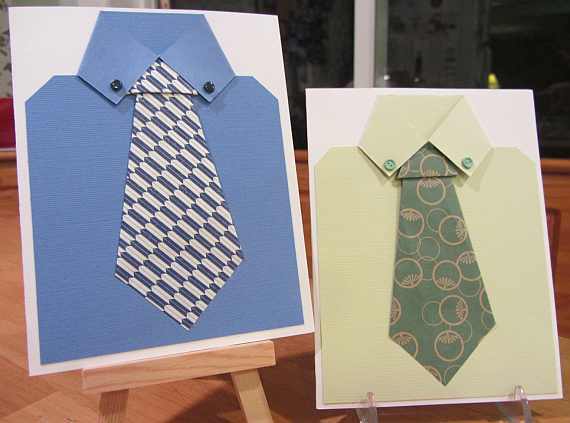 I used scraps of cardstock for all of the shirts, and brads, buttons and Origami paper from my stash to create the cards. I will be shipping them off to Operation Write Home for Father’s Day cards. Trenton always folds the neckties for me and I create the shirts. We’re a good team! These are really fun cards. If you’d like to make some yourself, there here is a tutorial link for you to follow. It is a great way to use up your extra scraps of paper! Thanks for visiting. This was a really fun sketch to use. 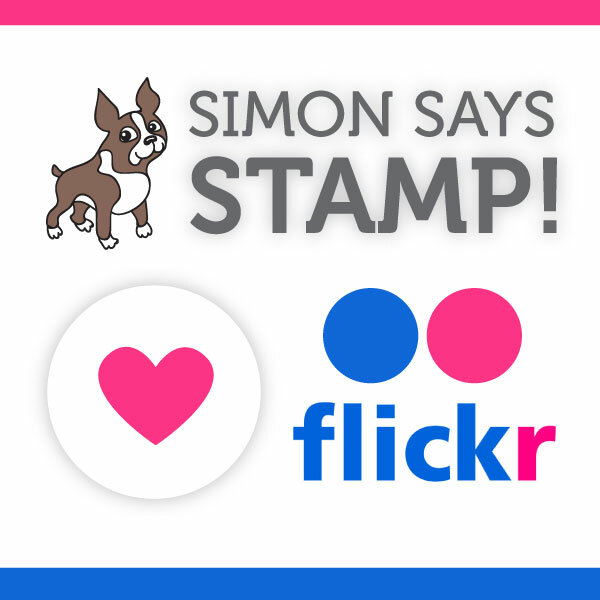 It is Sketch #117 at Operation Write Home Stars and Stamps, and the current sketch challenge. You can use a variety of papers together (which can be dangerous!) and it is symmetrical, which keeps a little formality to the design. I added some texture with the polka dot embossing folder and popped up the circle containing the sentiment to add to the dimension. 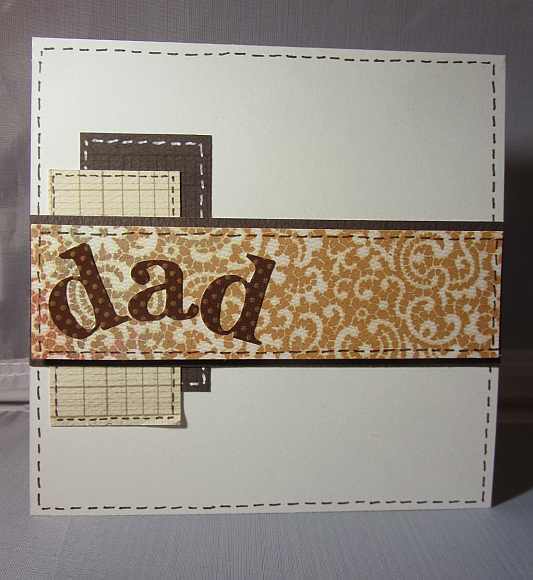 I will add this to my Father’s Day/Dad cards for Operation Write Home. Thanks for your visit today. 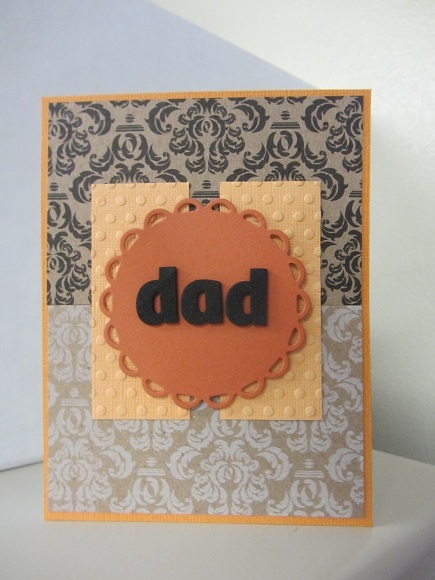 I used Sketch #153 at Unscripted Sketches as inspiration for this clean and simple card. This sketch is part of the Third Blogiversary celebration at Unscripted Sketches, where there is a different sketch every week. I made a “Dad” card for my shipment to Operation Write Home, since we are trying to make a lot of Father’s Day and Dad cards this month for the troops to use to send home. I added faux stitching to the edges of all the elements to add a little more detail. Thanks for stopping by. I made this card using the current sketch: #152 at Unscripted Sketches. The colors are quite muted, but kind of pleasant that way. 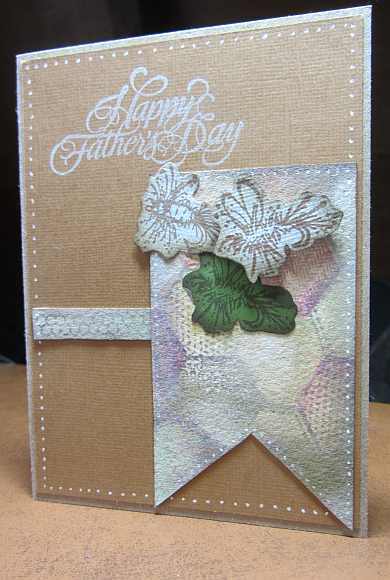 This card will go in my next box for Operation Write Home (OWH), since we are trying to make lots of Father’s Day cards for the heroes to send home. The Our Daily Bread Designs (ODBD) Challenge on OWH Stars and Stamps for April is to feature an animal on a card. 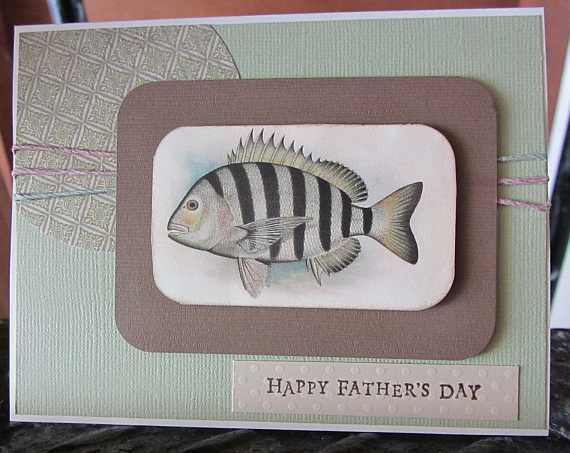 I have a collection of fish images from Lisa Vollrath and Ten Two Studios that I though work well for Father’s Day cards. So that was my animal of choice! The really cool thing about this challenge is that for every 25 cards we make, ODBD pays for the shipping of a box of cards to our deployed troops. We have been making at least 50 every month that ODBD has sponsored this challenge. That is a big help! Thanks for visiting today. 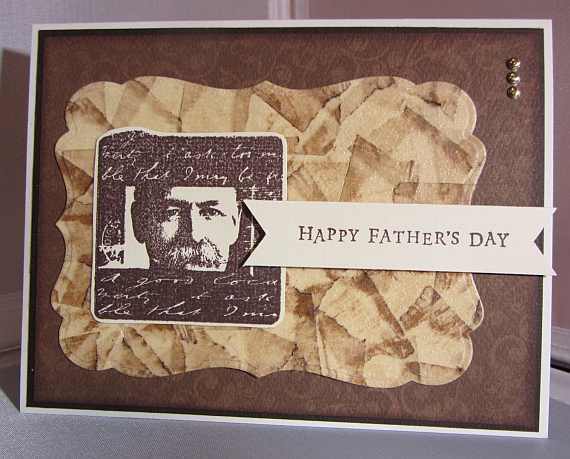 This background was featured in a tutorial at Operation Write Home Stars and Stamps this week. I made the faux leather background with overlapped masking tape rubbed with Distress Ink and heat set with clear matte embossing powder. It has an interesting texture and mine sort of resembles leather. It was fun to try it out and is always gratifying to make my own backgrounds. Thanks for checking-in with me.